Painting by Brendan Neiland, British artist born 1941. Entitled "Aluminaire". Oil on canvas painted c.1980, signed on reverse with stencil 'Neiland'. Brendan Neiland is one of Britain's foremost contemporary painters and he is represented in many major UK and international museums and galleries. 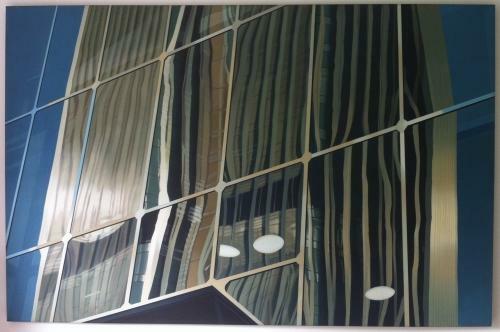 This painting is typical of his work featuring the soaring glass and steel structures of modern corporate architecture and the mystery of mirrored light.